The judgement on triple talaq will be out soon. The debate in the past few months has starkly posed issues related to gender justice, secularism and the uniform civil code. And yet, there is practically no sound analysis based on data, despite how central empirics could be, to resolve such an issue. Of the little bit that people have written, the data is dangerously misrepresented. For example, the oft-cited claim (including by Kapil Sibal on 26 May 2017 in this article) that 68% of all divorced women are Hindus while only 23.3% are Muslims, is flimsy and meaningless. Hindu women outnumber Muslims by five times, so it is only logical that the share of Hindu women in the divorced women population will be higher. Some media reports have also suggested that the divorce rate among Muslims is lower than among Hindus (PTI, India Today, 8 April 2017). This is, again, plainly incorrect, as I show below. This claim was made by the women’s wing of the All India Muslim Personal Law Board (AIMPLB) and the data used comes from self-selected 16 family courts in a country with 439 family courts (as on May 2016), which gives a hugely incomplete and distorted picture. Flashed in the form of big, bold headings, incorrect data is a recipe for uninformed judgement. I pulled out data from Census 2011 to see divorce rates in the two communities. Divorce stock ratio can be defined as the total number of divorced persons in a community to the total number of married persons in that community (I don’t call it divorce rate because rate is a flow, and the census only tells us stock, but analogically, it’s the same as divorce rate). This ratio is 2.0 for Hindus and 3.7 for Muslims. This means that for every 1,000 married Hindus, 2 are divorced, and for every 1,000 married Muslims, 3.7 are divorced (for India, this value is 2.4). Across gender, the disparity is wider (most men remarry but women can’t, hence the disparity). For every 1,000 married Hindu women, 2.6 are divorced, while for 1,000 married Muslim women, 5.6 of them are divorced. As for men, the ratio is almost the same (1.5 for Hindu men and 1.6 for Muslim men). This implies that population and marital status adjusted, Muslims are more likely to be divorced than Hindus, and Muslim women take up almost the entire burden of this difference. About 78.7% of Muslim divorcees are women; for Hindus, this figure is 64.2%. This data is replicated with minor differences across rural and urban India. 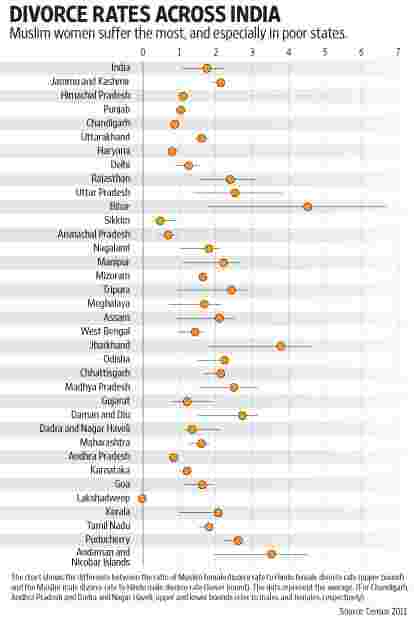 In general, divorce indicators are slightly worse in urban than rural India, which is not surprising. And what is the regional make-up? I estimate the divorce rates across all states, for Hindus and Muslims, and examine the difference between males and females in the two religions, across all Indian states. This is calculated by dividing the divorce rates of male Muslims by that of male Hindus. The same value is also estimated for Muslim and Hindu females. The two ratios are then plotted, showing the difference. If ratios are greater than 1, it shows that the divorce rate among Muslims is higher than among Hindus. A few interesting ideas can, then, be drawn. Among big states, except Punjab, Haryana, Assam, Bengal, Gujarat, Andhra and Kerala, Muslim men have a higher incidence of divorce compared to Hindu men. And even in the states mentioned, the difference is marginal (the ratio is greater than 0.9) except in Gujarat, where Muslim men are doing better than Hindu men in their marriage dissolution statistics. But more important is the state of women. Except Haryana and Andhra Pradesh, Muslim women show much greater divorce rates than Hindu women, with the greatest number in Bihar, Uttar Pradesh, Rajasthan, Jharkhand and Madhya Pradesh. When we see the difference between the two ratios, we get a picture of the extent to which Muslim women’s position vis-à-vis Hindu women is worse than the Muslim men’s position vis-à-vis Hindu men. In other words, a higher difference suggests a larger burden of divorce borne by Muslim women as compared to Muslim men, relative to their Hindu counterparts. This difference is largest in Bihar, Jharkhand, Uttar Pradesh, Rajasthan, Madhya Pradesh, Gujarat and Kerala. If an index is designed, reflecting how (demographically) burdensome marriage dissolution is for women compared with men in different states of India, we see the poor states will take the highest positions. This means that the differential impact of divorce across gender, while higher for Muslims than Hindus, and higher for women than men, is also higher in poor regions than in rich ones. It must be said, at this point, that we don’t know how many Muslims get divorced using triple talaq. And so, it cannot be claimed that higher divorce rates among Muslims are a result of triple talaq. But the purpose of this article was not to claim such a thing but to dispel incorrect data presently in circulation as regards Hindu and Muslim divorces and marriages. The court must decide whether triple talaq is unconstitutional or not. But in doing so, if it chooses to rely on data, it must be done carefully. Yugank Goyal is associate professor of economics at the O P Jindal Global University.